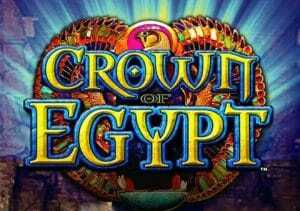 Take a trip to the land of the pyramids in Crown of Egypt, an ancient-themed video slot from IGT. It’s played using the Multiway Xtra game engine which offers 40 paylines plus 1,024 ways to win. Also on offer is a bonus feature that awards up to 130 free spins. Head to the desert from between 80p and £400 per spin. The design on show in Crown of Egypt is rather impressive – the setting is the interior of a pyramid. Joining the A to 10 playing cards are a trio of 3D Egyptian hieroglyphs as well as a Pharaoh and the Egyptian Queen who is the most rewarding symbol. Rounding out the symbols is the Scarab Beetle which is the game’s wild – it appears on reels 2, 3, 4 and 5 only and replaces all symbols with the exception of the bonus triggering scatter. The action plays out to a haunting backing track which has a slightly sinister feel. The reel set up is a little unusual here. There are the standard 40 payline as well as the 1,024 ways to win option where winning combinations are created when the same symbol lands on adjacent reels. If you can afford the maximum and play both, it certainly ups the pace. The main feature offering is the Free Spins Bonus feature. Once again, the way this is triggered is slightly unusual – instead of landing the scatter (the pyramid symbol) on different reels, you need to land 2 or more of them on the middle reel. 2 will get you 10 free spins. 15 are on offer with 3 with 4 of them triggering 20 free spins. You can trigger more free spins if 2 or more bonus scatters land on the middle reel on the same spin. A maximum of 130 free spins are possible here! The gameplay here is solid rather than spectacular – the MultiWay Extra game engine means that there are plenty of winning opportunities on offer in the base game as well as the free spins round. We’d put the overall variance in the low to medium range. If you enjoy the Egyptian theme but prefer video slots that are a little more explosive, then you may want to give Crown of Egypt a swerve and opt for IGT’s other ancient favourite, Pharaoh’s Fortune instead.